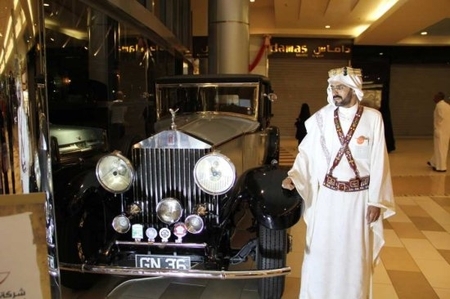 Saudi checks out classic Rolls that his wives are not allowed to drive. Soon he won't be able to afford it, either. Israel’s ambassador to to the US, Michael Oren, recently asked “what happened to Israel’s reputation?” He compared the picture of Israel presented by a Life Magazine article in 1973 with that in today’s media, and asked why — given the real sacrifices that Israel has made to buy the ‘peace’ that the Arabs aren’t selling — Israel is consistently vilified. It began with PLO Chairman Yasser Arafat’s 1974 speech to the U.N., when he received a standing ovation for equating Zionism with racism—a view the U.N. General Assembly endorsed the following year. It gained credibility on college campuses through anti-Israel courses and “Israel Apartheid Weeks.” It burgeoned through the boycott of Israeli scholars, artists and athletes, and the embargo of Israeli products. It was perpetuated by journalists who published doctored photos and false Palestinian accounts of Israeli massacres. Actually, it began in the 1960’s, when the PLO — supposedly under the tutelage of the KGB — recast its message, presenting the vicious terrorist movement as a struggle for national liberation of an oppressed people, the ‘Palestinians’. Liberals in the US, guilty about the racist mistreatment of black Americans, and Europeans suffering pangs of Holocaust guilt, ate this up. But while the trope was effective, it didn’t spread all by itself. It was nurtured (lubricated?) by one thing over all: Islamic oil. This was manifest in numerous ways. The “oil weapon” itself was brutally used in 1973, to strike a massive blow at Western economies and influence the West to force Israel to give up the territories conquered in 1967, a theme that has become embedded in US and European policy ever since. Of course “Israeli intransigence” was blamed for the pain. A more subtle tactic was the creation of a hostile environment on American university campuses. Surplus Saudi dollars, tens of millions of them, are funding “Middle East Studies” departments at our most prestigious universities, staffed almost 100% by anti-Israel academics. There is also money from the Gulf Emirates and Iranian sources dedicated to this project. Another use of oil money is for preemptive bribery of government officials, who are given to understand that if they behave properly while in office, they will be richly rewarded when they leave. Jimmy Carter is a well-known example, but there are many more. Europe has been more addicted to Middle Eastern oil than the US, whose biggest source of imported oil is actually Canada. And their behavior in the face of pressure has been correspondingly more craven. But this is about to change. And since the despotic regimes that rule the oil-producing countries — especially the Saudis — have done little with their windfall to develop alternate sources of income, they are going to have big problems as their monopoly erodes. This is happening today. Dore Gold explains that new sources of oil and gas found in the US, Canada and South America are expected to make the Western Hemisphere energy self-sufficient by 2030. Even Israel has new sources of natural gas. And the rest of the world’s energy supply will no longer be hostage to the Mideast-dominated OPEC cartel. So at long last we can say goodbye to the ‘oil weapon’ and to the use of surplus oil money to buy politicians and academics. Middle Eastern nations, economies and cultures will have to stand or fall on their own. Which do you think Westerners will favor then — the kingdoms and dictatorships where misogyny, slavery and exploitation flourish, or the one really democratic state in the region? This entry was posted on Friday, May 18th, 2012 at 10:24 am and is filed under General. You can follow any responses to this entry through the RSS 2.0 feed. Both comments and pings are currently closed. I’m afraid the loss of the oil weapon won’t have as great an effect as you hope. We’ve already seen how Jew hatred takes priority or everything else liberals pretend to believe in, equal rights, freedom of the press, freedom of religion, democracy, impartial judiciary etc. They’ll just blame the greedy Jews for taking away the oil money from the arabs. This is an encouraging article, but we still have a long, hard fight ahead of us. It will take years to develop these other sources of oil. That is the first problem. But Arab/Muslim petrodollars are flowing right now, every year, year in and year out, into college campuses, corrupt government officials, and media organizations. Just like the cat that keeps coming to my back door because I give him treats, those sucking at the Arab/Muslim petrodollar teat will do so as long as they can, with predictable results. Suppose, for example, Marathon Oil were to develop some big domestic source of energy to compete with Middle Eastern oil. To get rid of this influence, Marathon would have to “outbid” the Saudis, Iranians, or other Gulf oil sheikdoms, and use the money similarly. Would they even bother doing this? It is not as if the Arabs won’t be able to sell their oil. Maybe less to us, but they’ll be getting plenty of money from China and India, for example, who have insatiable appetites for energy – especially China, who also certainly has the money to buy it. The only way I see change along these lines if if Israel uses some of her prospective energy wealth to fund Israel advocacy so as to compete directly with the Israel bashing activities funded by Arab petrodollars. Israel has an interest in doing this, but Western energy companies won’t care and won’t do it. Yes, eventually the oil will run out in places like Saudia and Iran. But that is decades away. When it does, then they will back on their camels and living in tents, and won’t be able to bribe anybody anymore. But that is still a very long way off. And then, as “mrzee” points out above, there is the factor of good old fashioned anti-Semitism/anti-Zionism. The Arabs and Iranians would be a lot less effective if they didn’t have the “raw material” to work with in the form of Western anti-Semitism. They use their resources in order to amplify this to a degree such that it is much larger and louder than it might otherwise be, but absent this, they’d be a lot less effective. Don’t mean to be so pessimistic. I actually have a guarded optimism that our side will indeed prevail in all of this, both in the narrow sense of Israel versus her adversaries and the West versus the Islamic fundamentalist Muslim scourge. But it isn’t happening next week. I hope to live to see it; I think we are looking at a 30-year timeframe, give or take. We will know we’ve won when the summer Olympics are held in Tel Aviv, and the Arabs come to play, too. I’m hoping to see this happen in 2048, when I’ll be in my 80s. No doubt the oil weapon played a key part in so many adopting the ‘Palestinian Arab poor underdog narrative’. No doubt the loss of that weapon will cause a certain loss of support for those hungry for Arab oil and money. But great damage has been done. The Arabs and certainly the Islamists have the numbers and momentum. The struggle against these forces will not be won easily or in a short time. We will need FresnoZionism to continue its part in the struggle for a long time to come.